The ps command produces a list of the currently running processes on your computer. This guide will show you the more common uses of the ps command so that you can get the most out of it. The ps command is commonly used in conjunction with the grep command and the more or less commands. These additional commands help to filter and paginate the output from ps which can often be quite long. The PID is the process ID which identifies the running process. The TTY is the terminal type. So what is a session leader? When one process kicks off other processes it is the session leader of all the other processes. So imagine process A kicks off process B and process C. Process B kicks off process D and process C kicks off process E. When you list all processes except sessions leaders you will see B,C,D and E but not A. Obviously the -N is not very sensible when used with the -e or -A switches as it will show nothing at all. You can return specific processes using the ps command and there are various ways to change the selection criteria. You might be surprised to see that this returns one process for each open tab. ps -G "accounts" ps --Group "accounts"
Alternatively, use the following to search by terminal type. Note that this shows the person whose credentials are used to run the command. For example, if you are ogged in as gary and run the above command it will show all the command ran by you. If you log in as Tom and use sudo to run a command then the above command will show Tom's command as being run by gary and not Tom. The -e, as you know, shows all the processes and the f or -f shows full details. The User ID is the person who ran the command. The PID is the process ID of the command the command. The PPID is the parent process that kicked off the command. The C column shows the number of children a process has. The STime is the start time for the process. The TTY is the terminal, the time is the amount of time it took to run and command is the command that was run. The extra columns are SZ, RSS and PSR. SZ is the size of the process, RSS is the real memory size and PSR is the processor the command is assigned to. There are many more options but these are the most commonly used ones. ps -e --format="uid uname cmd time"
You can mix and match the items as you wish them to be. Again there are more options available but these are the most common ones. As mentioned at the beginning it is common to use ps with the grep, less and more commands. The grep command helps you filter the results from the ps command. The ps command is commonly used for listing processes within Linux. You can also use the top command to display running processes in a different manner. 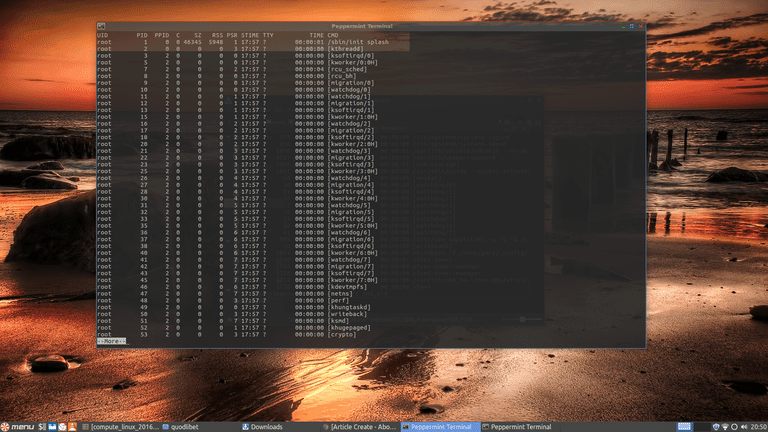 Example Uses of the Linux Shell Command "ps"